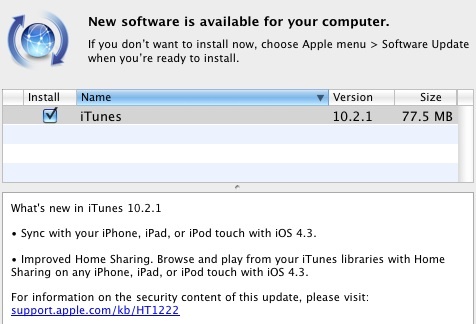 A new iTunes 10.2.1 update has appeared in Software Update, superseding the iTunes 10.2 update released just last Wednesday to support iOS 4.3. The new update can also be obtained from Apple's iTunes download page. The update description is exactly the same as for iTunes 10.2, so it is unclear what has been changed since last week's release at this time. Changes are presumably minor, however, although they may include important bug fixes. After an initial report this morning claiming that iOS 4.3 would appear today, three days ahead of schedule, The Loop has reported that users should expect the public launch to occur tomorrow. Sorry I'm a noobie to this forum so forgive my posting of something irrelevant to this thread. Maybe it's cause I just joined but this those options aren't available to me. lol, no, sorry; I just find any excuse to post a link to that video in relation to a resurrected thread. You misunderstood me... I said the distance you are from the VRAD determines the profile you are on... a 19mb profile can provide 1 HD stream and 3 SD streams. A 25mb profile is capable of 2 HD streams and 2 SD streams, and a 32mb profile can provide 3 HD streams and 1 SD stream... All fo these profiles are available via FTTN with copper backhaul from the VRAD. In no case does anyone get 5 streams off of a single account. The current hardware in the field is not capable of this. I'm not going to argue with you but rest assured that the information I am providing you is correct. If you want to PM me your area, I will tell you exactly what is in the ground from your residence all the way to the VHO.